2003 marks the four hundredth anniversary of the publication of the First Quarto of Hamlet. It is interesting to speculate whether or not the play would have become so famous if only this early version were known to the world; if both the theatre and the study were without the significantly greater number of lines of the Second Quarto and First Folio versions. 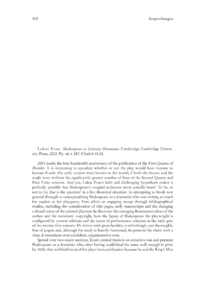 And yet, Lukas Ernes bold and challenging hypothesis makes it perfectly possible that Shakespeares original audiences never actually heard To be, or not to be; that is the question in a live theatrical situation. In attempting to break new ground through re-conceptualising Shakespeare as a dramatist who was writing as much for readers as for playgoers, Erne offers an engaging sweep through bibliographical studies, including the consideration of title-pages, early manuscripts and the changing cultural status of the printed playtext; he discusses the emerging Renaissance ideas of the author and the stationers copyright, how the figure of Shakespeare the playwright is configured by current editions and the status of performance criticism in the early part of the twenty-first century. He writes with great lucidity, is refreshingly and thoroughly free of jargon and, although his study is heavily footnoted, he presents his thesis with a clear, if sometimes over-confident, argumentative tone.